interested in Prius plug in hybrid & Subaru XV but don't know which is more suitable for me. Would be interested to know other alternatives . 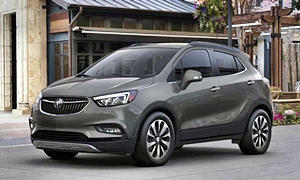 My 70-year old nlaws like their 2015 Buick Encore. They wanted something with AWD as they never owned one before. We owned a 2013 Encore and at 60 mph on the highway it would see almost 40 mpg...with AWD. It wss super efficient if you kept your speeds at the posted limit. The elevated driving position makes see around bigger vehicles a little easier than a sedan or small hatchback. The seat height was perfect as there was no leaning or climbing to reach seat height. The turning radius is great for small parking spots. It would be a vehicle to live with for ever but a little on the small size. They paid $16K with on a 2-year old car that has the remainder of 4 years, 50,000 mile warranty. But if you didn't need AWD Encore's can be found for less than $20K brand new. 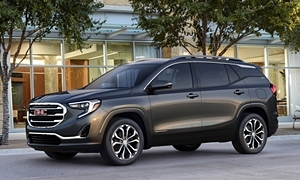 Just contact your local Buick dealership after you've search the options you want at Buick.com and what dealership pricing is for your trim level. "The2017 Subaru Imprezais one of the starkest examples. 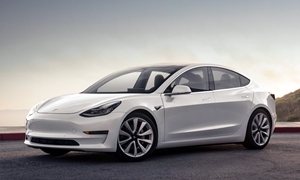 The 2016 model was rated as Very Reliable, but after the car was redesigned for the 2017 model year, a full 20 percent of the new version's owners reported problems with the in-car electronics. These include the rearview camera freezing or having a blank screen, no radio reception, and problems pairing to a smartphone...."
We have no reported repairs for either the 2017 or 2018 Impreza, but we also exclude problems that can be fixed with a software update. Although CR instructs people to only report serious problems, I have a hard time seeing how glitchy software fixed with an update can be considered serious. Responding to the Gthpson,if you're considering the hybrid version of the XV Crosstrek it wasn't much more efficient than the non-hybrid and was last offered in North America as a 2016. I hear that the 2018 (only offered as a non-hybrid) drives much better than the 2017, but I haven't driven one yet myself. The Prius Plug-in Hybrid has been replaced by the Prius Prime. Even the new car doesn't have much range on battery alone, about 25 miles. 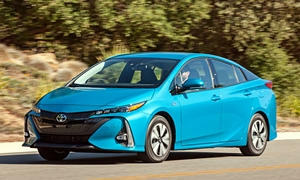 The regular Prius is so efficient it would be difficult to justify paying more for the plug-in Prime. But after tax credits the Prime costs less than the regular Prius. If you don't mind (or actually like) the styling, it's hard to argue against a Prius. I notice that both of the cars you mention are hatchbacks. Is this a requirement? Hyundai and Kia recently introduced the Ioniq and Niro, respectively. The Niro is styled like a crossover, but is just a little roomier than the related Ioniq hatchback. We don't have any reliability information for them yet. Still, both are worth a look. The Niro is offered as a hybrid and as a plug-in hybrid. The Ioniq is additionally available as an EV. If you don't require a hatchback, a hybrid midsize sedan would be more comfortable. The 2018 Toyota Camry Hybrid is already available, and the 2018 Honda Accord Hybrid soon will be. The new Accord is very impressive. 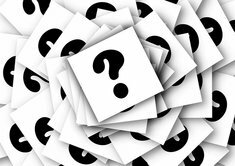 Some other cars you should be looking at are the Toyota RAV4 Hybrid (MPG is 34 city/30 hwy) and Honda CR-V (MPG is 28 city/34 hwy). The Toyota is more reliable and the Honda has a few problems with the infotainment system. The Honda would be my choice because of a nicer interior and driving experience. 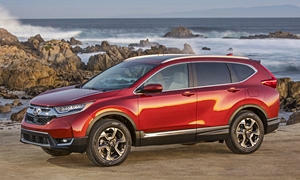 If you do hwy miles mostly, CR-V is more efficient. 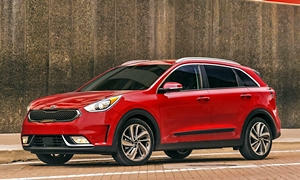 These small SUVs are perfect for retired and older people because they are easy to get into. First year reliability wasn't great for the CR-V on TrueDelta, but this year will probably be better. 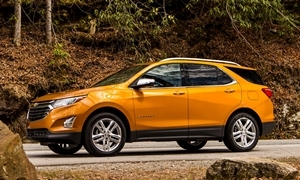 Or you could get a Chevy Equinox Diesel, but those are overpriced without incentives. There are always incentives though. There is no reliability data on the diesel, but expect it to not be good in its first year. You mentioned the Prius Plug-In. The Prius Plug-in is the one made from 2012-2015 and it was a failure because it was just a regular Prius that had 12 miles of EV range. The new Prius Prime has a 22 mile range and is a much better car in every way (except EV range is still nothing great). The Prius is very reliable and can get 60+ MPG when your EV range runs out. The 2016+ is very comfortable. The 2016+ Prius is notably harder to get into than the previous generations. The regular Prius is just as efficient as the Prime when both are running on hybrid mode and the regular Prius has more cargo space and an extra seat. I get 54 mpg hwy in my 2016 Prius and 57 in the city. If you don't have a lead foot, the car can see well over 60 MPG. The regular Prius has a decent amount of extra space compared to the Ioniq and Niro. No one knows about the reliability of the Ioniq and Niro, but it probably won't be good in the first year or two. These cars are more conventional in styling comapred to the Prius. The Subaru Crosstrek is not as efficient as the Prius and is slow. Otherwise, there isn't much wrong with it. It won't be as reliable or comfortable as the Prius. I would only buy a Subaru if I needed AWD. As mkaresh mentioned, there is minimal MPG gain with the XV Hybrid. The fact that the gas powered version probably has lower repair costs (it was Subaru's first hybrid I think) and is more popular means the regular gas version is better. 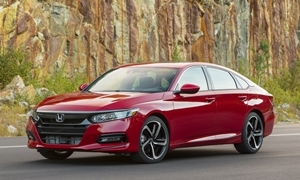 The Accord is really worth a look. I was very impressed when I test drove one. The Equinox diesel can be had for $26K on autotrader. It is thr least expensive diesel suv sold in the US. Malibu Hybrid is an option and peaks near 50 mpg. 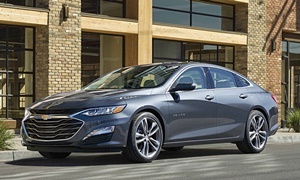 With discounts the Malibu will E about their less expensive except for maybe thr new Sonata Hybrid which Motorweek has improved with thr new redesign. I believe Subaru is getting too bog, too fast. A number of quality issues have rose since last year and their hough they are quick to fix, the simple software update to solve the wiped out the infotainment system since March 2017, is still leaving some without backup camera and side traffic alert. And this was after multiple attempts to fix. Motorweek didn't improve the Sonata, Hyundai did. 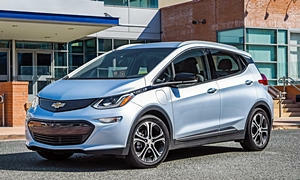 If you want an efficient car and only need a little over 200 miles, the Chevy Bolt is available and gets up to 235 miles on a charge. No gas, all electric. It isn't as good as a Tesla Model 3, but these Bolts are available right now and get you a higher range in base trim. My wife has been waiting for her Tesla Model 3 configurator email for almost 2 years now and delays are still piling up. Only a few people cancelled their reservation. Overall, there are many good choice. I should have also though to suggest the Malibu Hybrid, Sonata Hybrid, and Bolt EV as possibilities. My main reservation with the Malibu Hybrid is I have no idea how reliable it will be--they're pretty new and we have no data on them. With the Sonata Hybrid, my main issue is it's not as fuel efficient as competitors. I've observed much better fuel economy in the Camry and Accord hybrids.